On a recent trip to Santa Fe, New Mexico I was visiting the Palace of the Governors and the New Mexico History Museum when I spotted a building in the courtyard between the two. There was a sign above the door which read – “The Press at the Palace of the Governors.” As I walked in the door, I was transported back to my childhood. You see, I grew up in a family that owned a printing company. Some of my earliest memories were of watching my Dad set type and run the letterpress. And “The Press” had drawers and drawers of type and a letterpress just like the one we had at Metcalf Printers in Itasca, Illinois in the early 1950’s. I introduced myself to Tom Leech, Curator of the The Press at the Palace of the Governors, and he listened patiently as I described to him how thrilled I was to be in his shop. After more than a few minutes, I asked him about his background. He said that he was born in the Midwest and moved to Colorado Springs in the mid-1970’s. I replied that I knew the city well since I went to Colorado College. He said he knew Colorado College since he had worked at the Press at Colorado College from 1978 to 2001. He worked with a man by the name of Jim Trissel. Did I know him? 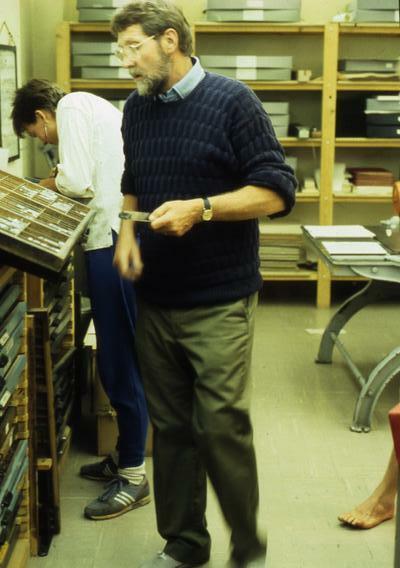 Professor Jim Trissel – I knew him well. He was one of the best teachers I ever had – probably the best. His art history courses were outstanding. This was many years before the age of Powerpoint so all of his visuals were done with slides. He must have prepared for many hours for each class since all of the slides fit together perfectly to tell the story of art. Each of his classes was a masterpiece. He was my inspiration for my lifelong interest in art. Jim was also a golfer. He knew I was a golfer. My Senior year at CC, he called me almost weekly to ask if I wanted to play in his group. I don’t think I ever turned him down. Jim was a good golfer, fun to play with and a nice guy. So, not only was he a great teacher, he was also my golfing buddy and friend. It was a sad day for me when I learned of his passing in 1999. I came back to the Press at the Palace of the Governors the next day. Tom was kind enough to give me a brief demonstration of some of the things he was working on. 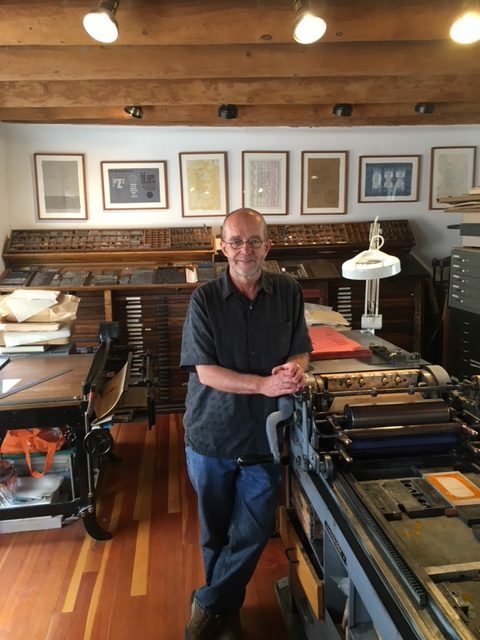 He said that he does most of his printing on his Vandercook letterpress. Letterpress printing has been involved in a modernization trend. The invention of polymer plates created from a photo image has simplified and improved the print preparation process. Tom also showed me some of the pieces created at “the Press.” There were two award-winning books. There was also a stunning single sheet piece that he ran through the press 8 times to obtain the right colors and effects. He is a patient, creative and artistic printer. His results show it. Thank you, Tom, for being such a good host.